Christine DeRosa/Contributing Photographer The stand-up comedian performed in Lecture Hall 1 for SAPB’s second fall comedy show. 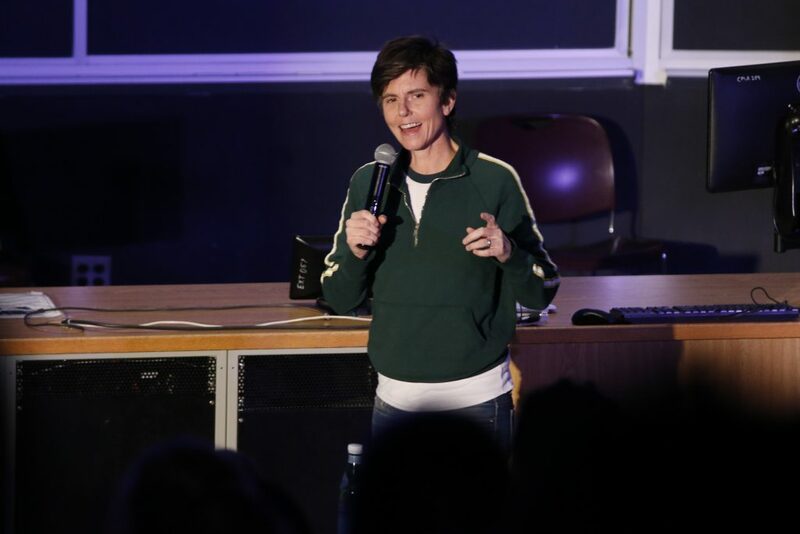 21 Savage may have been scared of a little snow, but Tig Notaro certainly wasn’t. On Friday, Nov. 16, the Emmy-nominated comedian performed for a cold yet cheerful crowd in Lecture Hall 1. Jillian Pizzuto, comedy chair of SAPB and a junior majoring in Spanish, organized the event and noted Notaro’s popularity with students. The opener for the show was Jeshua Dejesse, an e-board member of Bing Stand-Up and a senior majoring in biology. His set, similar to Notaro’s style, played upon tragedies in his life. Notaro started off her show by commenting on the peculiarity of the Lecture Hall 1 setting and interacting with students in the crowd. One unidentified student sitting near the front of the hall told her that he took an archeology class in the room, but his friend sitting next to him quickly informed Notaro that he was lying and actually took anthropology. Madeleine MacLean, a freshman majoring in political science, said she enjoyed Notaro’s interaction with the students. “I thought she really showed her wit in how she interacted with the audience and incorporated the setting into her comedy,” MacLean said. Consistent with her style, Notaro also brought up recent health scares, including one that just happened this week when she suffered from internal bleeding while at home. After the premiere of “Instant Family,” she was going to sleep and got a sudden stomachache. Her wife ended up calling 911 and two “very muscle-bound” EMTs came to her house. The EMTs picked her up out of bed while she was in her pajamas and carried her down the stairs. Notaro also went on to talk about how she once had to get her wisdom teeth surgically removed and drove herself back home. The audience gasped at every part of the story, which prompted Notaro to make a joke about it, too. The highlight, however, was at the end, when Notaro talked about attending Ellen Degeneres’ 60th birthday party. Singer Adele was in attendance as well, but did not perform. In response, Notaro went on stage, asked a sound person to play Adele’s song “Hello,” and sang along to it while pressing random keys on the piano. While reenacting this scene, Notaro once again commented on the obscurity of Lecture Hall 1 and keyboard she was provided for the skit. Daniel Morales, a freshman majoring in electrical engineering, attended the show with friends. “I never heard of her so I thought she would be a mediocre comedian, but I ended up really enjoying it, especially when she was doing impressions,” Morales said. While the freezing Binghamton weather has finally commenced, the show seemed to warm up Lecture Hall 1 with laughter.